Did you know billions of dollars are spent on companies like Uber, where customers can request an on-demand service from their phone? This need for on-demand services is breaking into the Fitness & Wellness Industry and if you’re a “one man show” without the right technology, you’re risking current and potential new customers going to a competitor that does. Instructors that offer on-demand booking mobile booking will grow at a shocking 60% faster rate in 2017. Our mission is to empower new instructors so they can now compete and win in today’s new mobile economy. 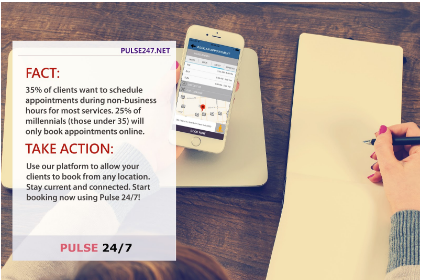 CIF and Pulse 24/7 are inviting you to subscribe to the platform for just $9.99. Please click on the following button to activate your account today!